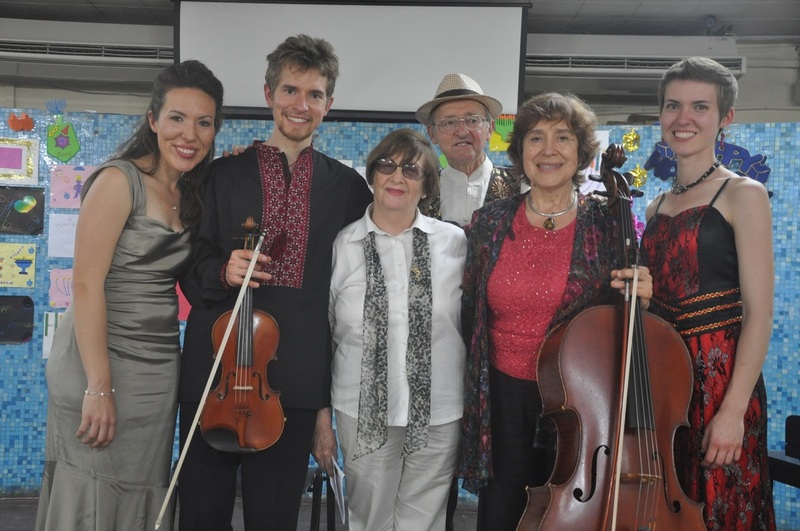 The Jewish Community of Lithuania invited the American Virtuosi/The Borowsky Family ensemble to perform special concerts honoring the victims of the Holocaust on the occasion of commemoration ceremonies during September 2018. These concerts were combined with the visit of Pope and included the world-premiere of composer Giedrius Kuprevicius’s work, “The Star of David" on the occasion of the 75th anniversary of the liquidation of the Vilnius ghetto (this concert was internationally televised). 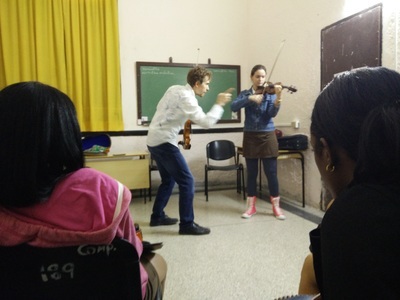 Under the theme "Music: the Best Bridge for All People" programs included compositions by the American Virtuosi and other American composers. 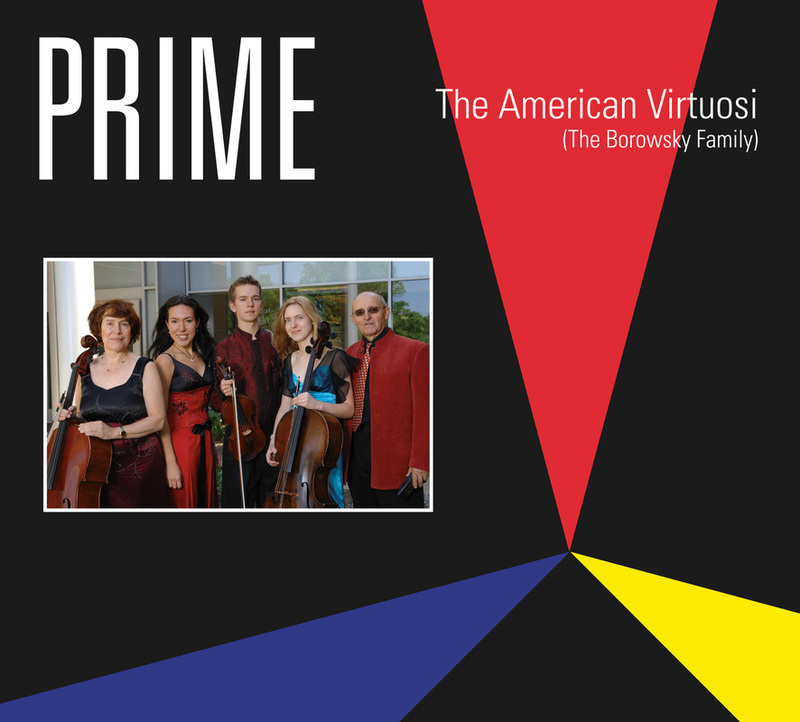 In appreciation for their contributions, the American Virtuosi received several awards and distinctions from The Jewish Community of Lithuania, the Embassy of the United States in Vilnius, and Lithuanian social and cultural organizations. The American Virtuosi toured Lithuania from April 4-25, 2016 on the invitation of social, cultural, and religions institutions. Under the theme, “Music: The Best Bridge for All People,” they performed concerts, presented masterclasses, and gave lectures at universities, churches, synagogues, and cultural centers in Vilnius, Kaunas, Klaipeda, Siauliai, Panevėžys, Alytus, Pakruojis, Trakai, and Anykščiai. Events were sold-out and audiences rewarded the Borowskys with multiple standing ovations. Musical programs featured virtuosic selections by classical composers, as well as the Borowskys’ own compositions and arrangements. In several concerts they performed together with renowned Lithuanian musicians: members of the National Symphony and the Dagilelis Boys Choir. During their three week tour, the Borowskys were received and honored by public officials, including the Mayors of Šiauliai, Panevėžys, and Klaipeda, the Ambassador of Israel to Lithuania, leaders of the Lithuanian Jewish community, and representatives of educational, cultural and social organizations. ​Ms. Faina Kukliansky, Chair of the Lithuanian Jewish (Litvak) Community stated: “I would like to cordially thank you for taking the time to visit our communities in Vilnius as well as other Lithuanian cities, bringing the joy of your music to each of them. Your imaginative approach to art is truly appreciated, so are your devotion and commitment as family and as musicians. 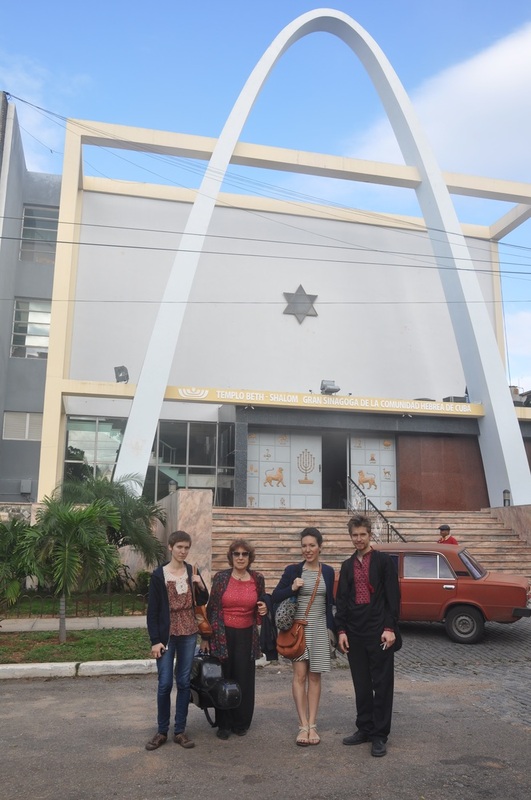 Lithuanian Jewish communities look forward to your future concerts in Lithuania with great anticipation." 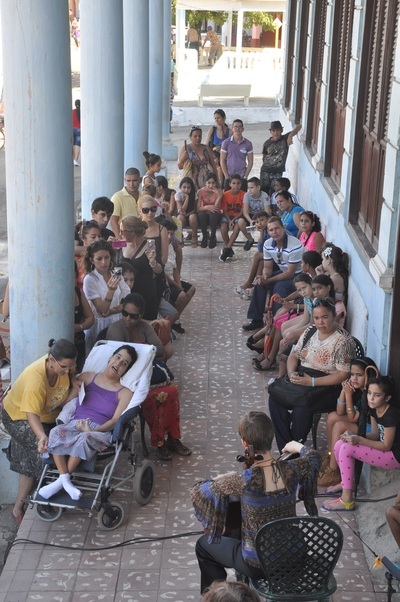 As the iron door into Cuba is slowly creaking open, Americans are eager to visit, discover, share, help, and perform. 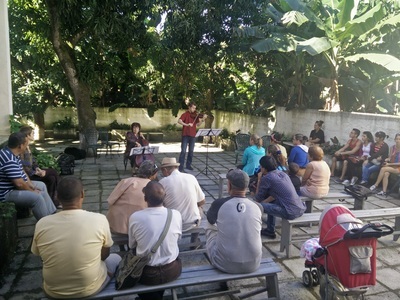 My family’s January 2016 tour was my second trip to Cuba, and there were some marked differences this time around. Back in 2012, my parents, brother, and I spent ten days visiting and performing in Cuba. For that visit, we had to obtain a special permit from the U.S. Treasury Department. 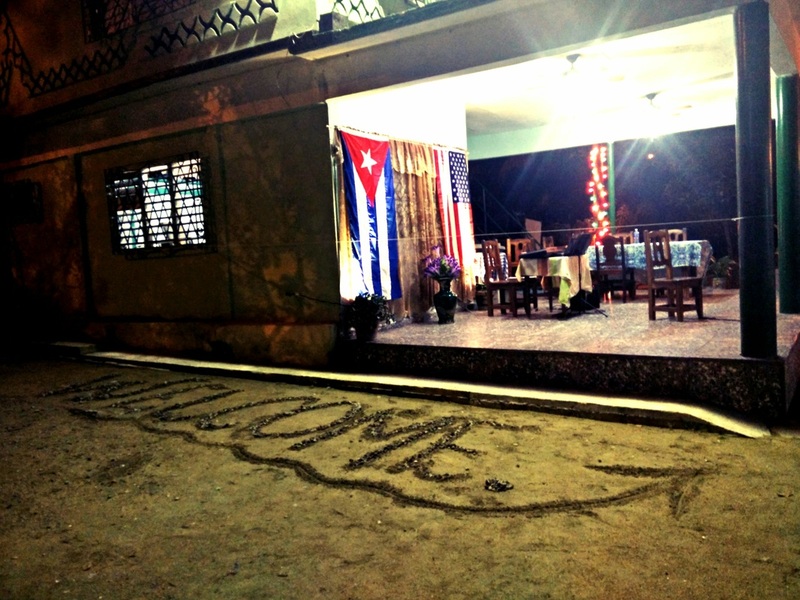 Those were the “early days” of Americans being able to gain access to Cuba, and we had a carefully curated itinerary with a host who made sure we saw and experienced only the best side of life in this often complicated country. We marveled at the colorful antique cars, enjoyed the tropical fruit, and performed at Havana’s Cathedral and the Instituto Superior de Artes. We brought gifts of much appreciated school and medical supplies and left with a moderate sense of accomplishment. 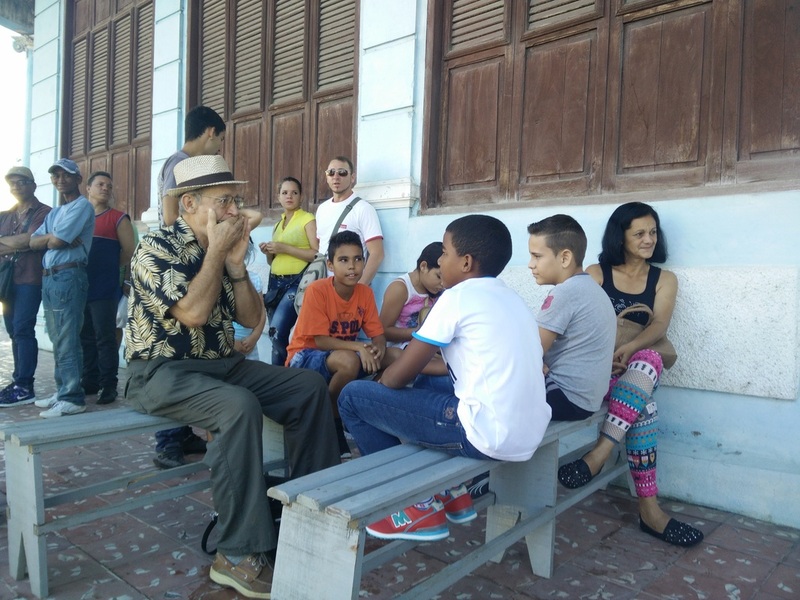 This most recent trip was specifically formulated to get us out of our comfort zone and into the homes and hearts of the Cuban people. The official mission was grand: “Music: The Best Bridge for All People.” The schedule featured performances, master classes, and meetings in Cienfuegos, Cumanayagua, Trinidad, and Havana, with regional representatives of the Ministry of Culture as well as with representatives of the Polish and American Embassies. Performances would take place in concert halls, but also in museums, Christian and Jewish places of worship, schools, libraries, and town squares. This was not our first tour with this theme; similar past tours in Lithuania, Poland, and China were met with enthusiasm. 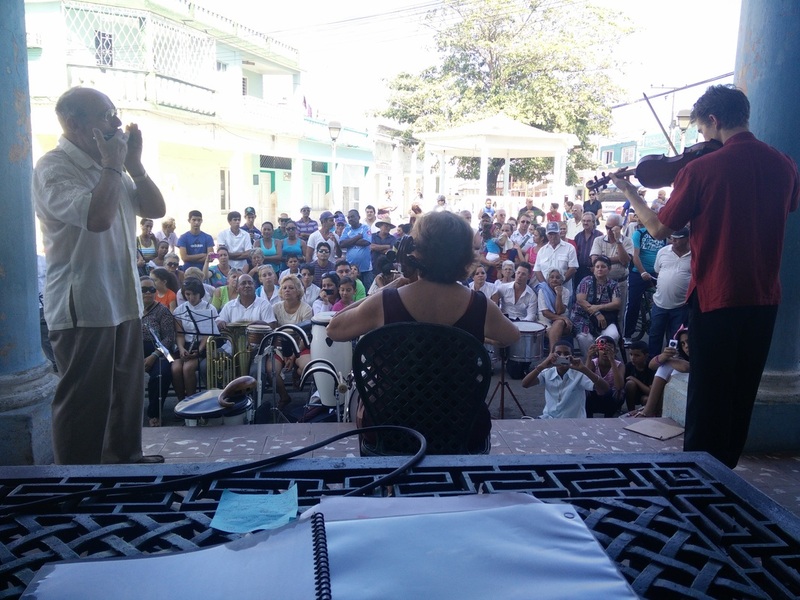 Even so, given the complicated history of the United States and Cuba, and a program which included works by Bach, Beethoven, and Chopin, I wondered what we could expect… and what we could offer. After all, I wasn’t an expert in economics or politics or business, and I only knew a few words of Spanish. Our journey successfully led us out of our comfort zones and onto the back of a converted flatbed truck which careened through the countryside, taking us from one performance destination to the next. We walked a mile each way for lunch and dinner, shared beds (my sister, my brother, and I), and experienced two weeks of cold showers and occasional electricity blackouts. We had no access to cell phone service or internet, effectively cutting us off from our version of reality and fully immersing us into another. 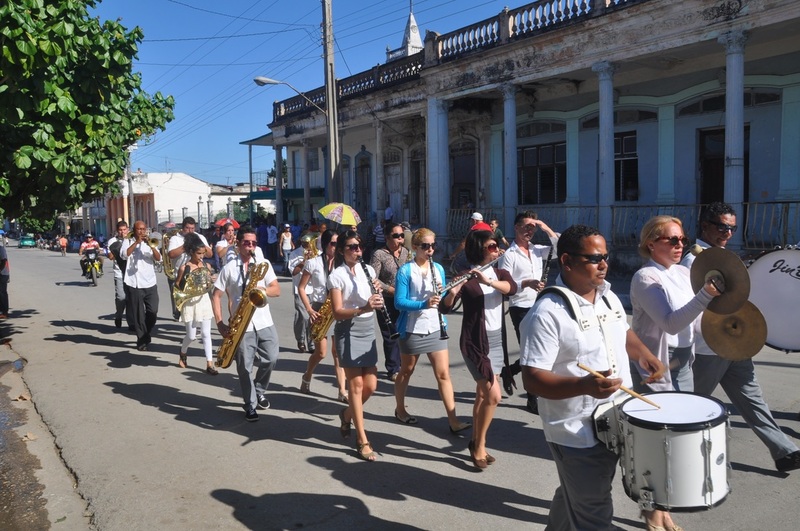 The result of veering from the well-paved path we had previously traveled was an opportunity to experience Cuba in a way rock stars and politicians might never enjoy. An after-concert celebration consisted of ice cream scooped out of a large plastic bag into disposable cups and eaten with plastic forks. We joined kids in using long poles to knock coconuts out of the tall trees. We were asked to perform in the home of a teenage girl with cerebral palsy, served as special guests at a fashion show in a tiny rural town, joined in the celebration of a young woman’s 21st birthday party, and spent our downtime tutoring school children in English. We had a peculiar sense of experiencing times gone by, and it wasn’t just because of the brilliant-colored vintage cars which were meticulously maintained to continue running. In the morning, we would see women using a bucket of water to mop their tiled front porches. Little stores selling kitchenware and pipe fittings would appear on the side of the road as we went by. Throughout the day, we would hear the clip-clop of horses pulling carts filled with passengers. The streets were crowded with people walking, women carrying umbrellas to shield themselves from the sun. In small towns, bicycles are still considered a luxury and they often feature a handmade wooden seat attached to the crossbar for a passenger. The cars and trucks rumbling down the dusty streets would leave behind them a thick fume of exhaust long after they disappeared from view, and we saw an abundance of hitchhikers. Second story balconies and the staircases leading up to them often lacked railings, and the concrete of many apartment buildings was crumbling at the seams. After school, the streets were full of children kicking soccer balls or playing hoop and stick. Parents sat in rocking chairs on their front porches, observing passersby. Groups of older men gathered together at the park in the center of town, huddled around a concrete table, intense looks on their faces as they played game after game of dominoes. In the evenings, we could see into the apartments through the screenless, curtainless window shutters or wide-open front doors, and observe families watching a show on one of the handful of available television stations. On weekends, we heard loud Latin pop music playing and discovered crowds of young people partying in private clubs in homes. We were reminded of how much we Americans have. Simple things we take for granted would catch us by surprise, like our difficulty in obtaining a rubber band to fasten a foam chin rest for a young violinist (we found one in our luggage). As we witnessed everyday items we would throw away without hesitation being cleverly reused and recycled, it seemed that the expression “necessity is the mother of invention” could have originated in Cuba. We gave what we had intended to give, but when we ran out we emptied our suitcases to share the belongings we had brought with us and could easily replace when we returned home. During our correspondence in the months preceding our visit, we learned that Cuban musicians have many professional needs. With the support of friends who attended our pre-trip benefit concert, as well as IUStrings, D’Addario, and Légère, we were able to effectively respond. We brought them instruments and supplies including professional quality congas and stands; more than 150 carbon fiber and natural reeds; an assortment of sheet music for wind and brass instruments, band, and string ensembles; an electric guitar; two violins and cases; several sets of violin, viola, and cello strings; carbon fiber bows, rosin, and music stands. The Cumanayagua Band performed a special concert in celebration of the supplies they received. Afterwards, the director told us, “We have been rehearsing for two years and never could perform because we don't have congas… The only piece written without congas is the Cuban anthem! Now, in your presence, we had our first performances. The instruments are first-rate. We are so very happy!" However, the most personal gift we brought with of us was weightless, shapeless, colorless, and could not be held — music. 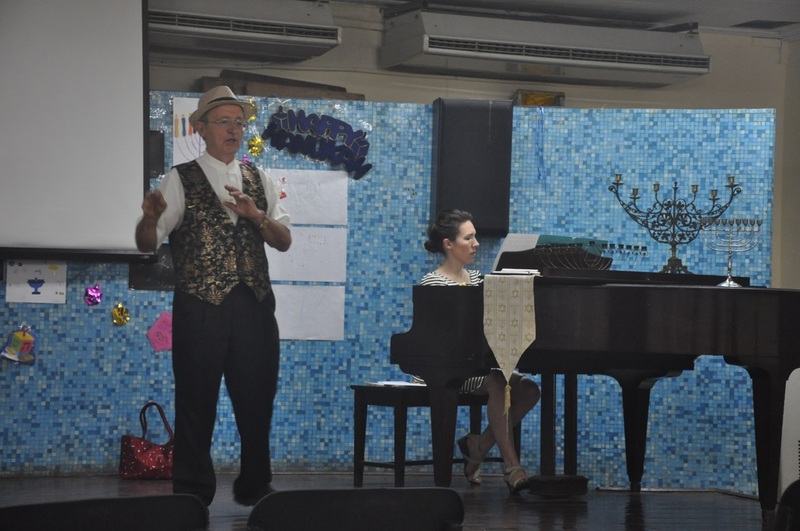 I wrote a short song, “Hola Amigos,” which we taught the audience at the beginning of each concert and sang together. It moved me to see the entire audience singing along, smiling and swaying from side to side. Although our programs were comprised of western classical repertoire and our own compositions, some of the loudest applause came when we performed American folk tunes like “Yankee Doodle,” “Camptown Races,” “Oh Susanna,” and “Battle Hymn of the Republic.” Each time "Guantanamera" was announced as our encore, the audiences would sing along, sharing verse after verse. 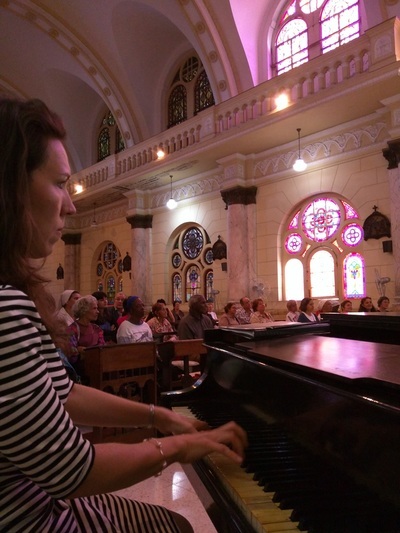 After a performance at a church in Havana, the audience erupted in excitement. A man from the audience dashed into the sacristy, pulling out a conga and gesturing that he would join us. The entire church jumped into the performance, singing and dancing, and two nuns rocked it out as soloists. There were some professional challenges, highlights for me being a performance on a five-octave, touch insensitive, pedal-less electronic keyboard, and the New York Steinway which I was so excited to see until I opened up the lid and discovered little piles of wood granules made by the termites that were devouring it. Although the conditions were sometimes challenging, the solidarity we felt with our hosts encouraged us to make the most of every opportunity. They had invested their enthusiasm and energy in presenting us to their communities as ambassadors of goodwill. 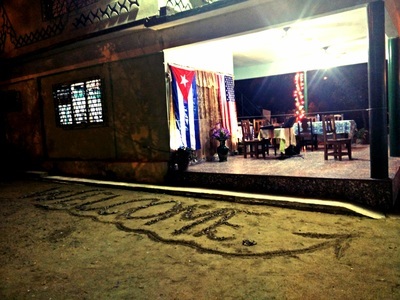 We noticed that at some performances the American flag was displayed alongside the Cuban flag. When a small town opened a public performance in the town square with the American national anthem, we were genuinely moved. Throughout several decades of travels, we have marveled at centuries-old buildings which have withstood the rise and fall of empires. Just as each stone in these ancient structures was carefully placed into position in a way that would weather the turbulence of time, the strongest alliances between people and nations are carefully fostered by personal interactions. During this international visit, we felt the telltale energy of the beginnings of true friendships. 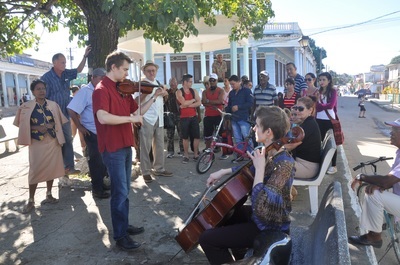 Perhaps it was just a single brick in a massive economic, political, and social building project, but we have experienced the power of music bridging cultures and we cherish this highly personalized opportunity to help rebuild the relationship between the United States and Cuba.